Reads Around the Internets - Where Do Jobs Come From? Welcome to the weekly roundup of great articles, facts and figures. These are the economic and financial finds that made our eyes pop. Economist Jared Bernstein has laid out in simple, easy to understand terms, the theory of stimulating the economy to indirectly create jobs. This article is in reference to Uncle Ben's latest quantitative easing. Read more about Reads Around the Internets - Where Do Jobs Come From? Anyone find these economic stimulus packages put out by the government and the Federal Reserve ridiculous at this point? 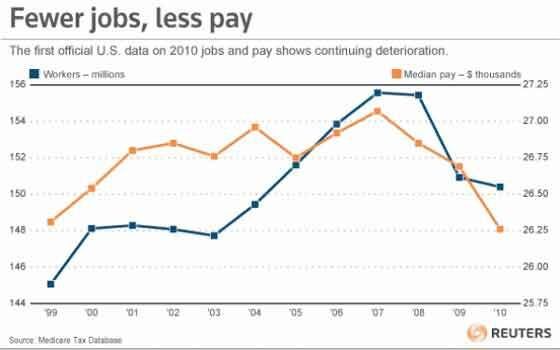 The reality is a direct jobs program would be much cheaper and much more effective to get the economy moving. Yet, magically that idea has been dismissed and worse since 2008. Federal Reserve Chair Ben Bernanke will do more quantitative easing. That's the consensus from his Jackson Hole speech. As usual, the utterances on labor are ignored by Wall Street or in this case, used to justify Wall Street's crack addict quantitative easing fix. The stagnation of the labor market in particular is a grave concern not only because of the enormous suffering and waste of human talent it entails, but also because persistently high levels of unemployment will wreak structural damage on our economy that could last for many years. Taking due account of the uncertainties and limits of its policy tools, the Federal Reserve will provide additional policy accommodation as needed to promote a stronger economic recovery and sustained improvement in labor market conditions in a context of price stability. Bernanke is justifying this action through various studies claiming quantitative easing generated jobs. Federal Reserve Chair Ben Bernanke gave testimony before the Joint Economic Committee and the doves fell from the sky. Bernanke cut short Wall Street's addict like demand for more quantitative easing and instead suggested a host of policies to boost hiring and real economic output. On the labor markets, Bernanke's testimony validated our analysis, that one cannot blame the pathetic jobs market on the weather. More-rapid gains in economic activity will be required to achieve significant further improvement in labor market conditions. In fact, Bernanke suggested the next FOMC meeting discussion question will ask: Will there be enough growth going forward to make material progress on the unemployment rate? This is good, Bernanke realizes the #1 threat to the U.S. economy is the jobs crisis. The CBO has issued a new report on what all of those automatic budget cuts are gonna do in 2013. They will cause a recession. Growth in real (inflation-adjusted) GDP in calendar year 2013 will be just 0.5 percent, CBO expects—with the economy projected to contract at an annual rate of 1.3 percent in the first half of the year and expand at an annual rate of 2.3 percent in the second half. Given the pattern of past recessions as identified by the National Bureau of Economic Research, such a contraction in output in the first half of 2013 would probably be judged to be a recession. What the CBO is referring to is the fiscal cliff. Remember when the budget crisis happened, resulting in the United States losing it's AAA credit rating? Then, Congress and this administration just punted, didn't compromise, or better yet, base recommendations on actual economic theory, and allowed automatic spending cuts of $1.2 trillion across the board, to take place instead. These budget cuts will be dramatic and happen in 2012 and 2013. While inane campaign rhetoric lulls you to sleep, forcing you to watch reruns of shipping wars until your brain melts and flows into that puddle of lost dreams and promises, Congress has been up to some things. Remember those outrages du jour, such as using Stimulus funds to hire foreign guest workers? Remember your hard earned taxpayer dollars being used to bring in Chinese foreign workers and Chinese steel to build the Oakland Bay Bridge in California? A very important amendment passed the Senate and was entered into Bill S.1813, MAP-21, alternatively known as the Transportation Bill. The amendment strengths the Buy America provision by closing a loophole. Congressman Peter DeFazio smelled a rat and boy did he find one. A host of Oregon forest thinning and clearing jobs, created by the American Recovery Act and funded by taxpayer dollars, went to foreigners, brought over on H-2B guest worker visas, instead of unemployed Americans. DeFazio fought and obtained funding for those forest projects and jobs in the 2009 Stimulus bill. DeFazio assumed with so many unemployed and desperate U.S.
We all know the United States needs jobs. We need jobs right now! Last week Obama proposed a new Stimulus plan, which we did a first pass on. Unfortunately most press is busy covering superficial politics instead of what is in the bill, how it would be paid for and most importantly, the effectiveness, or lack thereof. USA today claims the plan is to tax the rich as they put it, or as we put it, close loopholes and tax hedge fund managers, currently living living high off the hog at a 15% tax rate. Here's the gist of how Obama plans to pay the $447 billion his plan costs. One cornerstone of Obama's jobs plan is a $120 billion payroll tax cut. This tax cut has been enacted already for 2011 and according to Obama, the claim is this tax cut put an average $1000 into worker's pockets. This is a tax cut that reduced those Social Security contributions, what you see as FICA, the social security component, on your W-2, by 2% for 2011. That's right, they defunded social security by 2% for 2011. Social security is calculated on gross income, normally 6.2%. This is why attacking social security is almost a crime. You've actually been putting money into your benefit your entire working life. It's capped to a wage base and for 2011 it's $106,800. Additionally, median income is a tad misleading, for it's household income, on aggregate, instead of individual income. Additionally, it's not median wages, which since social security is a regressive tax, affecting wage earners disporportionately, using median income to estimate the tax benefit isn't quite right. After all, most of us are have nots, the median wage for 2009 was $26,261, much lower than the household median income of $49,777 for 2009. Paul Krugman shows the 2009 economic stimulus was not enough. We've shown as have many others, tax cuts for the rich do not create jobs. Yet, many criticized the $787 Billion Stimulus bill as spending, loaded with political favors and misdirected funds. For example, 84% of the green jobs went offshore and build America bonds were yet another gift for Goldman Sachs. The problem with the original stimulus wasn't that it wasn't big enough. It was not smart enough. What we need is true domestic stimulus. If you're going to spend our money to stimulate our economy, stop shipping our dough to China instead. Is this possible? Can one stop the offshore outsourcing of jobs, especially jobs created with our hard earned taxpayer dollars? Is there anything that can be done which actually goes to American workers? Why yes there is. First and foremost, all stimulus funding should have two mandatory requirements, Buy American and Hire America. If a government is enacting Keynesian economic stimulus, they must keep that spending within the domestic economy they wish to stimulate. The last thing America's workers need is stimulating China's economy and generating more jobs for them.